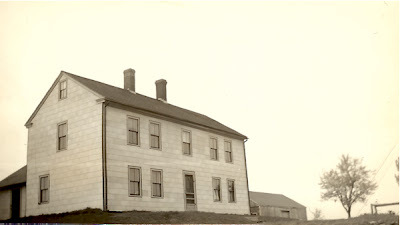 The house below is identified on the back of the photo as the "Ed Nichols House" built by Ebenezar Cutting 1812. The photograph, along with many other photos, and documents are part of my collection originally owned by Winifred Tillyer, Sturbridge historian. When the Historical Society obtains space for a permanent display of artifacts and documents in town, I will arrange that the collection can be displayed there. In the meantime, I will put them here for you to enjoy. Does anyone know where this old house is, or was? Fiske Hill Road. Not sure of the number but it looks like it still has the same type of siding, too. Wally, perhaps you can copy and paste this link??? It's the town census of 1900 with an Edward Nichols listed on page 2, line 79. Thank you for sharing the link. There is not a street address, which would be invaluable. I'm thinking that the census may start at the Fisk Hill area (edge of town) and work its way through, street by street. Because that name is on the second page, perhaps Fisk Hill is a good guess. If there's anyone who would recognize the names of the families listed around the Edward Nichols family name, that should help, as I believe they would be his neighbors. That might be one way to locate the address. Perhaps you noticed that the Cutting family name was still in town, too. I believe I saw it on the third page near another Nichols. Using common sense for a number of years, I would put stock in the location of the chimneys rather than the location of windows. It's way easier to block off windows than move chimneys to either side of a dwelling! I still think it's the house on Fiske Hill, most recently owned by a doctor. In regard to the stone silo pictured as the frontpiece of this blog: it's outstanding. I'm not sure that the property is "abandoned" but surely, such a historical architectural piece of Sturbridge from days gone by can be appreciated by most people, whether for its architecture, its artistic stone masonry, or its for its simple yet important contribution to agriculture? Dear Anonymous Re: the silo. That's an easy one. I knew it as the Finlay farm, on Finlay road (past the golf course on Holland Road). Looks the same today as in the picture because of neglect by a most recent owner. Jim Malloy blew this one. Had over a hundred acres with a pond and it was foreclosed on by the FHA(?). The property is adjacent to the Heins Farm which the town bought which in turn is adjacent to the land that goes northerly all the way to the river in Fiskdale. What a sanctuary for birds and animals that would have been. The town could have had it for taxes because that owner was so far in arrears." An old-timer told me that there was once a Nichols family living at the top of Bates Hill. Where is Bates Hill? On Finlay Road? Bates Hill is in Fiskdale, almost across from the laundromat. Dr. Brunelle's office (dentist) is on Route 2O, at the base of Bate's Hill.